Sierra Pipe Tobacco is a 100% all-natural high quality tobacco manufactured by Ohserase Manufacturing on the Akwesasne Mohawk Indian Reservation in New York. Sierra Pipe Tobacco is carefully cured and blended together for an easy slow elegant burn allowing for a smooth and mild experience. If you prefer to use a smoking pipe, Sierra Pipe Tobacco is the perfect tobacco just right for your smoking needs. Sierra Pipe Tobacco is distributed nationwide by Ohserase Manufacturing, LLC Akwesasne, NY located on the Akwesasne Mohawk Indian Reservation. 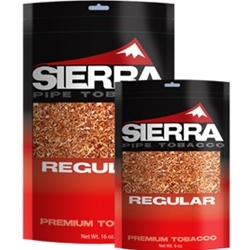 Each pouch of Sierra Pipe Tobacco are available at our online tobacco store in 3 unique styles to choose from. Regular, Smooth, and Mint.